Oil on panel, 37 x 40 cm. Dense smoke envelops a warship which has just fired a cannon from the starboard side. At the same time, two boats are mooring to the three-masted warship on the port side. The extensive detail that characterises the composition is an typical example of Hendrik Cornelisz Vroom’s unrivalled ability to paint marine scenes with great precision and accuracy. The artist is seen by many as one of the fathers of Dutch marine painting. His oeuvre included everything from dramatic naval battles to trading vessels about to make land in Dutch harbours. 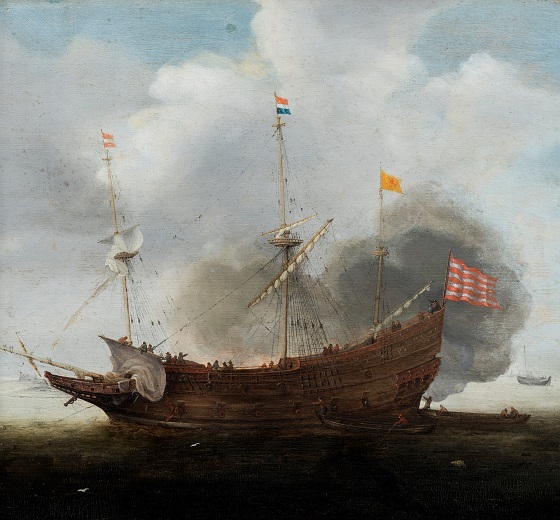 With his grandiose and artistic depictions of naval battles, seaside views and ceremonial scenes, Vroom introduced new subjects which were later taken up by the Haarlem marine painters, including Cornelis Claesz van Wieringen, Cornelis Verbeeck and Hans Goderis.